Garry Kasparov (born 13 April 1963 in Baku, Azerbaijan) is a Russian chess grandmaster and political activist. 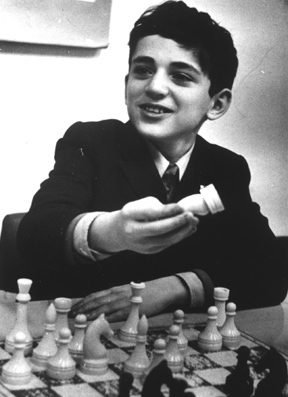 He was born with the name Garry Weinstein, and was the World Chess Champion from 1985 to 2000. In 1993 he broke away from FIDE to make a rival organisation (the PCA), because he felt FIDE had failed to raise enough money for world title matches. There is controversy about that period. By any measure, he is one of the greatest chess players of all time, and the highest-rated player before Magnus Carlsen. Kasparov became the youngest non-disputed World Chess Champion in 1985 at the age of 22. He held the official FIDE world title until 1993, when an argument with FIDE led him to set up a rival company, the Professional Chess Association. He continued to hold the "Classical" World Chess Championship until his defeat by Vladimir Kramnik in 2000. 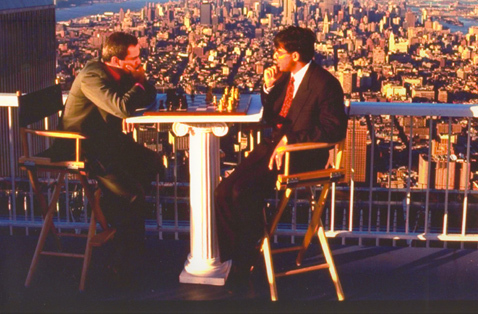 Kasparov lost a match (a series of chess games) against Deep Blue, a computer made by IBM, in 1997. Lately, retired from competition, he has been coaching Magnus Carlsen, the young player from Norway who is the current world #1. 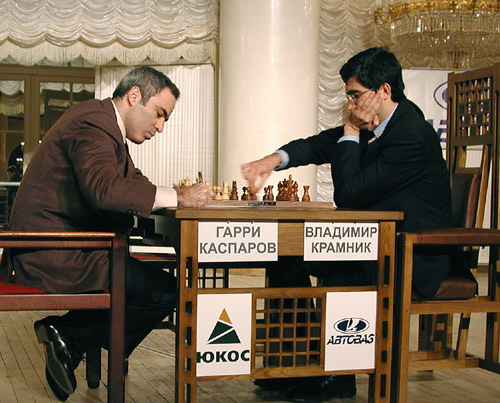 After retiring from chess, Kasparov became involved in Russian politics. In 2005, he traveled around Russia, speaking against Vladimir Putin, who was President of Russia at that time. The same year he created the United Civil Front, a political movement whose main goal is to dismantle Putin's regime and restore democracy in Russia. Kasparov was also one of the founders of The Other Russia, an opposition coalition which unites many left and nationalist politicians. He helped organize marches of dissenters involving several thousand people rallying against Putin and governors of Moscow and Saint Petersburg. In October 2007, Kasparov announced his intention of standing for the Russian presidency. In November 2007, he was detained by police at a rally in Moscow and given a jail sentence of five days. On 12 December 2007, Kasparov announced that he had to withdraw his presidential candidacy due to inability to rent a hall where at least 500 of his supporters could meet to endorse his candidacy, as is legally required. Kasparov's spokeswoman accused the government of using pressure to discourage anyone from renting a hall for the gathering. In 2008 Kasparov and his United Civil Front joined the Solidarity movement. Kasparov is among the 34 first signatories and a key organiser of the online anti-Putin campaign Putin must go started in March 2010. 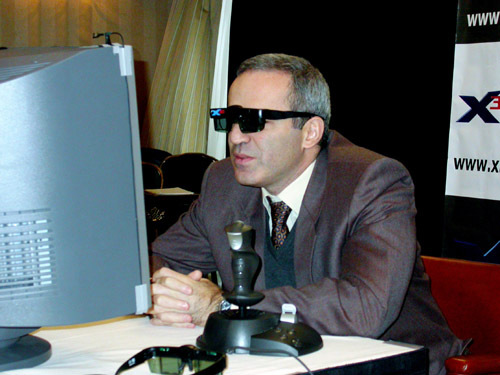 Kasparov wore 3D glasses in his match against the program X3D Fritz. Garry Kasparov Facts for Kids. Kiddle Encyclopedia.